FROM THE BEGINNING OF THE GREAT EAST ASIAN WAR.ON WHICH WE STAKED THE EXISTENCE OF OUR NATION,SUICIDE ATTACKS WERE THE AGES OF THOSE FEARLESS MEN RANGED FROM 17 TO 30.LEAVING BEHIND THEIR PARENTS AND LOVED ONES,AND ABANDONING THEIR OWN HUMAN-BOMB ATTACKS IN THE SKIES,ON THE SEAS AND ON THE LAND,WHILE THEY ACHIEVED OUTSANDING MILITARY SUCCESSS AT THE COST OF THEIR PRECIOUS LIBES. THE DEATHS TOTAL SOME 6,000 MEN.THE SUICIDE OPERATIONS,INCOMPARABLE IN THEIR TRAGIC BRAVERY,STRUCK TERROR INTO THEIR FOES AND ENGULFED THE ENTIRE COUNTRY IN TEARS INTO GRATITUDE FOR THEIR UNSTINTING LOYALTY AND SELFLESS SACRIFICE. 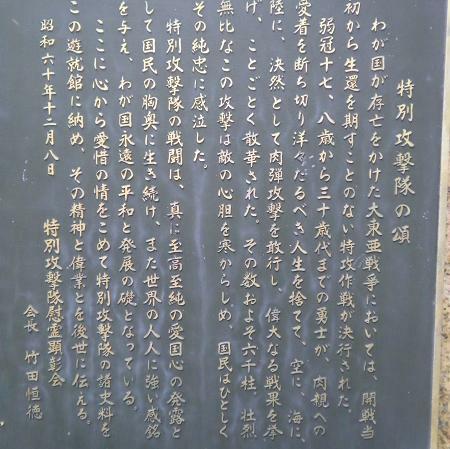 THE DEVOTION OF THE "TOKUBETSU KOGEKITAI" WILL REMAIN FOREVER IN THE HEARTS OF THE JAPANESE AS AN EXPRESSION OF PATRIOTISM,IN ITS NOBLEST AND PUREST FORM,WHILE AT THE SAME TIME LEAVING AN INDELIBLE IMPRESSION AMONG THE PEOPLES OF THE WORLD.THIS SPIRIT HAS LAID THE GRONDWORK FOR THE PEACE AND PROSPERITY OF OUR NATION TODAY AND IN FUTURE. IT IS WITH FEELINGS OF DEEPEST SORROW FOR THE DEATHS OF THESE YOUNG MEN THAT WE ENTER THE HISTORICAL MATERIALS OF THE "TOKUBETSU KOGEKITAI" IN THIS "YUSHUKAN". MAY THEIR SPIRIT AND THEIR REMARKABLE ACHIEVEMENTS INSPIRE US FOR GENERATION AFTER GENERATION. ASSOCIATION OF "TOKUBETSU KOGEKITAI IREI KENSHO-KAI"